Machine cut, hand finished, natural painted with: detailed landscaping, roads, walks, cars, people and water features. Fully detailed buildings with windows, facade and roof fenestration. Includes texture and color representations. Setbacks include window and door setbacks. Includes hardwood frame and Plexiglas cover for the Architectural Model Building. The Shops at Atlas Park has a unique collection of shops, restaurants, and services, over half of which will be making their Queens debut. New York’s first lifestyle center, The Shops at Atlas Park provides a shopping environment tailored to meet the needs of busy customers who value convenience. Whether it is a snack or a meal, a quick errand, or a longer shopping trip, Atlas Park allows you to savor the experience by providing covered parking and great stores all located close to home. 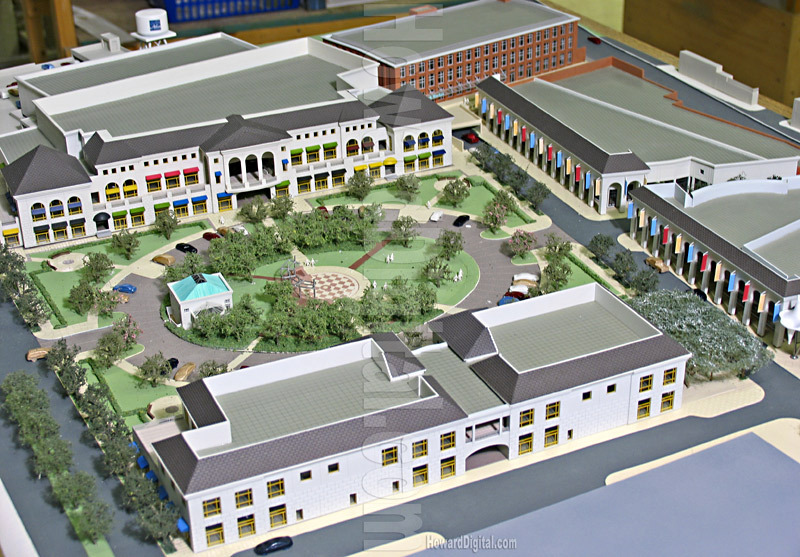 Beginning in late April and running through the summer of 2006, The Shops at Atlas Park will unfold, providing new things to see and do with every visit. Visit us again and again for an entirely new kind of shopping experience, right here in Queens. Catch a movie and dine out! Eight theaters with stadium-seating showing the latest movies in comfort and style, and six restaurants with wonderful food and fabulous atmosphere. Fine dining or casual, check out the options at The Shops at Atlas Park. From Zagat-rated restaurants to casual bistros and cafes overlooking The Green, we have the bill of fare you’re looking for. If you want the greatest variety and the freshest ingredients, you’ll be making regular trips to The Market at Atlas Park. You will find great service plus hard-to-find items located so conveniently in one great place, immediately adjacent to the covered parking. The best in meat, fish, produce, flowers, wine, bread and pastry. You’ll also find outdoor seating at the Market Plaza if you just can’t wait until you get home to have a taste.